As a Californian, lawyer, and author, Bob Goff could hardly be considered “normal.” He lives and loves in radical, challenging ways, unafraid to be completely vulnerable, even when addressing an audience as large and diverse as the one on at Regent University on Feb. 5. Feb. 5, 2016 – This was a night I had been waiting for. 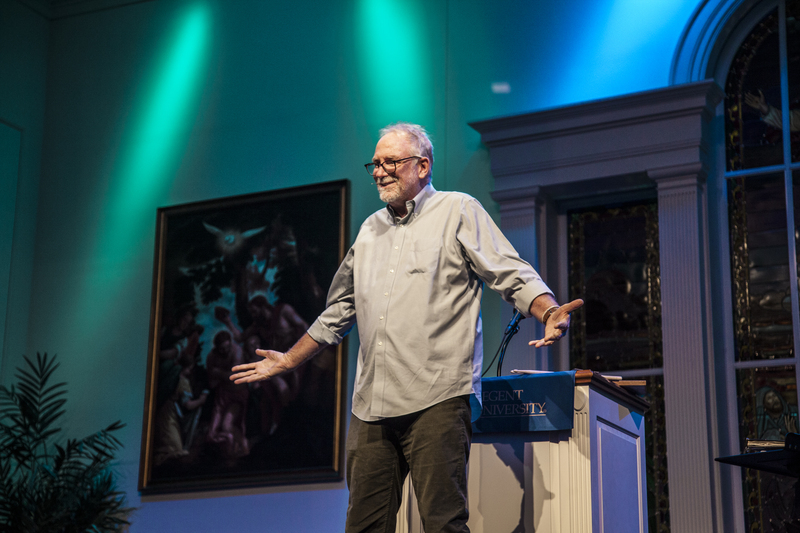 Bob Goff was speaking in Regent’s chapel to a crowd consisting of both Regent students, as well as members of the local community. His book, “Love Does”, was very influential in my life, particularly when I was in high school. I knew it was going to be a good night. Bob Goff, a lawyer and humanitarian, is known for doing some crazy things. It’s all because he’s taken the opportunities God’s given him, and has shown people that love is an action. I promptly ran back to the residence halls, flew into my room, grabbed my copy of “Love Does”, said good-bye to my confused roommate, and ran back to the Chapel. I am proud to say it only took me ten minutes, which for me, is a great accomplishment. Finally, the room filled with people from Regent as well as the community. After a short time of praise and worship, and an introduction from Regent School of Law’s Dr. Jeffery A. Brauch, Goff came on stage with a laugh and a smile, standing over the audience with his arms spread wide. “Can I just say, that [this] drummer plays like a boss!” said Goff. He motioned to the drummer, who began to play a beat, ending in an intense, rhythmic solo. The whole night was predominantly one long stream of stories. Goff told funny ones, heartbreaking ones, and awkward ones. They ranged from throwing an inflatable large-mouth bass over a men’s conference, to dealing with the grief of having their beloved peace-making cabin burnt to the ground. He even gave an account of when he was accidently kidnapped by a twitter follower (he ended up fine). With each story, there came a lesson the Lord taught him through the experience. However, there was one story he told that truly encompassed the main theme of that night. As a young man, Goff lived in San Diego, and surfed regularly. One day while he out, he tried to paddle out into the waves, but was continuously driven closer and closer to a set of cliffs. He was eventually smashed into them. A bystander saw his plight, and made his way down the cliff where Goff clung to the rock face. He then helped Goff climb back out. Goff went on to say that he was glad the guy didn’t just shout Bible verses at him, but rather climbed down, and thus spoke with actions. Through this experience, Goff came to realize the truth of Scripture and the action of love. He returns to this cliff every Christmas Eve to remember the fateful day. Love has action; it’s what his book talks about, and was the focus point of his amazing stories. At the end of his talk, he had everyone grab either a hand, arm, or shoulder (“anything that isn’t creepy”) of someone adjacent them. He then prayed over everyone in the room. As he closed, a bunch of us rushed to the front to try to talk with him. Clutching my copy of his book, I walked up, introduced myself and gave him a hug. As he signed my book, asked for his permission to field him a question. “Of course you may” he said. I said thank you as the next person came up in line to say hi to Bob. Walking away, I looked at what he had signed in my book. Bob Goff has made his life his work, and his work, loving and encouraging others, and serving Christ. That is our work too, and so I leave you with the message he left me.